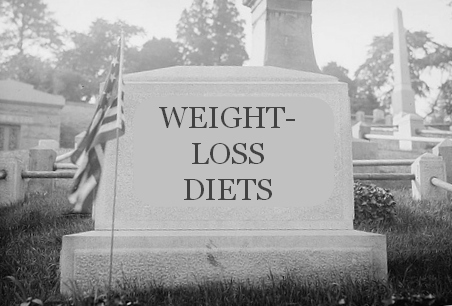 Diets don’t work in long-term effectiveness. They are a quick fix. One must change their lifestyle for long term success. So many diets have come and gone, with many promises of quick weight loss if certain programs are adhered to. It has quickly become a massive industry generating a lot of income, because of the desire of many people to achieve the slim-figure constantly shown to us in the media. It is interesting to note that, despite all the multitudes of dieting programs, there has been little success in the weight loss efforts of most of the population. People attempting to lose weight seem to do so initially at the start of these diet programs, but end up with much more weight after the dieting is over. This leaves them resigned, wondering how they blew it again. Maintaining a healthy weight involves much more than food restriction. It is a lifestyle that needs to be developed and not just a program to stick to for two or three months. 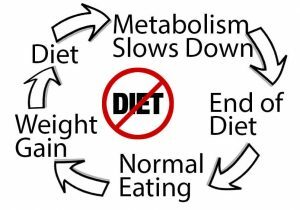 Dieting is just a temporary fix to solve your weight problems, the results really aren’t going to last, because once the diet has ended, you find yourself plugging back to the same old habits that got you stuck with the fat in the first place; and then the cycle continues. For effective weight loss, everything from what you eat, to how you think, to what you do, should all be in alignment with the healthy lifestyle that you are developing. A common assumption among dieters when they fail in their efforts to lose weight is that they are not disciplined enough, or that they lack the willpower to stay lean. Some attribute their dieting failures to their own laziness or gluttony, failing to realize from the inception that, dieting is bound to fail, because it is not a healthy way to lose weight. Meanwhile, losing weight shouldn’t be this difficult and strict-ruled. It is easy to maintain a healthy weight when it’s fun, and not with stringent rules. 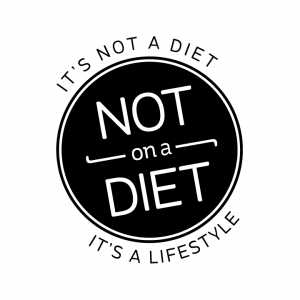 Dieting produces a kind of tension in our minds, with don’t- eat- this rules, eventually causing stress that makes many well-intentioned efforts backfire. Through research carried out by psychologists, it has been found that, dieting sends the message “I am being starved” to the brain. The result is that after the dieting period has ended, the body tries to regain every ounce of the fat it has lost, thereby leading to additional weight gain. Your body doesn’t understand the concept that you are dieting, instead it sees it as starvation and goes into fat storage mode; kind of like, storing fat for the ‘rainy days’. Diets really don’t work because they just focus on one aspect of weight loss: food. Other aspects such as mindset, exercise, sleep, stress management, and hydration are left out, making it totally one-sided, which is not what the body needs. Effective weight loss focuses on total management of every area of health and wellbeing, ensuring a balance and not starvation in any form. Cultivating sustainable lifestyle changes is important, much more than just focusing on food restriction alone. What we eat, and how much we eat is equally important, but that shouldn’t be the only point of focus or weight loss efforts will just be myopic and yield no results. It is overall important to look at our previous eating habits and patterns, why we eat what we eat and how we eat it. It is a process of changing our negative patterns all around, both internally and externally, to influence every sphere of our life, and not just our food. Dieting produces psychological effects such as obsession with food, and increased cravings to eat even in the absence of hunger, due to lack of attentiveness. 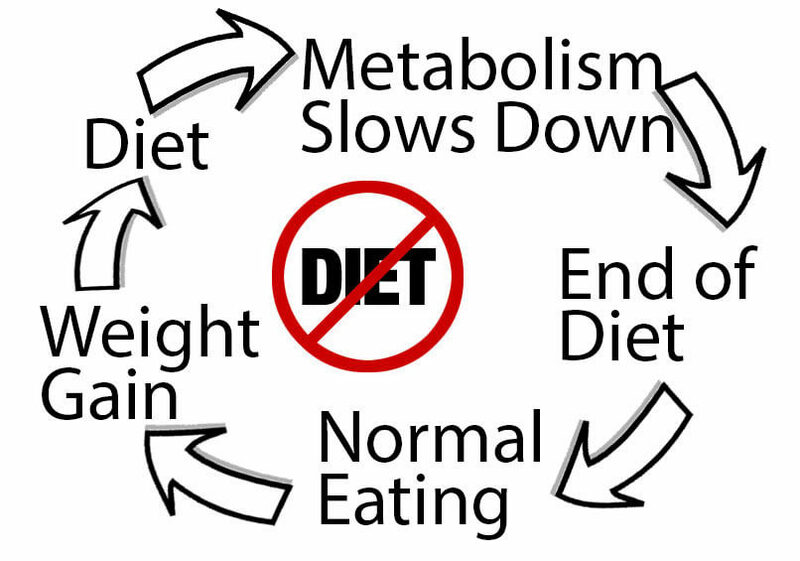 The rigidity and restriction of dieting may eventually lead to some form of eating disorder and binge eating. The high focus on weight loss in dieting may lead to depression and low self-esteem, when the dieter eventually finds out the approach isn’t yielding any positive results. Medical complications that can arise from diet due to starvation include: weakness, dizziness, irregular heartbeat, fatigue, and poor immune system. Getting past the don’t-eat-this-or-that to developing a healthy habit of choosing healthy pathways to staying healthy; having a healthy approach to living allows excess weight to be lost slowly and naturally, and because of the accumulation of healthy habits. This kind of lifestyle prevents you from being at war with your body through some diets that could damage internal workings of the body as a whole. When weight is lost through healthy lifestyle habits, the effects are lasting. Being healthy isn’t all about weight loss. It involves choosing to live daily with habits which ensure your overall well-being. Our lifestyle choices would determine in the long run whether the excess weight is lost, and not merely by boycotting certain foods. For overweight/obese persons, it’s a change that should be taken one step at a time. It should not be a quick fix, but instead a long-term guarantee to better living that improves overall health even without weight loss. Dieting or any method of losing weight other than lasting change in habits may cause more problems. Better lifestyle changes that can help maintain a healthy weight without any dieting input include eating consciously, ensuring to eat a balanced diet, being active and engaging in regular moderate physical activity.